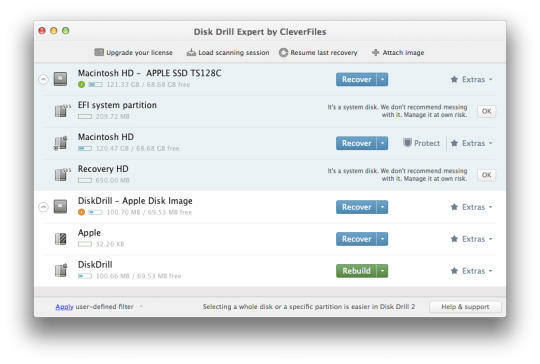 Disk Drill can recover your data from virtually any storage device. Whatever storage device you lost data from, if you can connect it to a Mac, Disk Drill can scan it and recover your lost data. Even if you're currently having issues accessing your hard drive or external device directly, there's a possibility our free data recovery software for Mac OS X can rescue data from it.Disk Drill means recovery for all major file types and file systems. With Disk Drill you can scan and preview your lost files for free. Disk Drill says NO to expensive data recovery in a lab... you don't have to buy anything until you are 100% sure that your data is recoverable.You can scan your drive or any other storage device and preview your files with Disk Drill Basic, it's completely free! Once you are sure that your files can be recovered, you can quickly upgrade to Disk Drill PRO or Expert to get your data back. However, additionally, if you install Disk Drill Basic before you any data was lost, Disk Drill's data protection algorithms will let you recover your data completely and for free!Did we already say Disk Drill lets you protect data and never lose it again? Disk Drill does even more! Its several free data protection features really set it apart from others. Once you have these features enabled, you'll never have to worry about accidental data loss again: Guaranteed Recovery invisibly makes copies of deleted files and folders you put in your Mac's Trash; Recovery Vault keeps records of all metadata for deleted files, so that they can quickly be recovered with names and file locations intact without occupying additional space on your Mac; S.M.A.R.T. Monitoring warns you of hard drive trouble before (!) it fails. Recover data on your Mac easily.